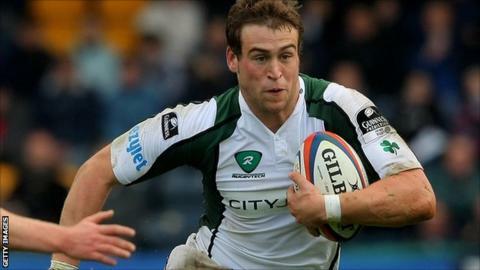 London Irish director of rugby Brian Smith has hailed the early-season form of back-row forward Jonathan Fisher. Fisher, 23, has returned to the Premiership club for a second spell having spent a year playing for Bedford Blues in the Championship. Despite Irish losing their opening two fixtures, Fisher's form has been the highlight of an otherwise poor start. "Jonathan has been outstanding and we've needed him to step up," Smith told BBC Radio Berkshire. Smith continued: "Jon was earmarked very early as being a bright talent and he might have been too anxious in his previous spell and tried too hard. "A season in the Championship where he has been a big fish in a small pond, pardon the pun, has seen him gain a lot of confidence from that. "When he left London Irish he was not full of confidence, that was no-one's fault. But if you look at him now, you say, "How can this kid not be confident?" It just happens sometimes with players." Irish were beaten 31-40 by Gloucester at the weekend, but Smith said the performance was a big improvement on their opening-day effort in the 40-3 defeat by Saracens. "We took a big stride forward from our first performance," said Smith. "Our attack was astounding, we created a lot of trouble for Gloucester's defence. "Our defence was quite good but we had a patch with about 10 minutes to go where we conceded two soft tries and there was a fatigue element also. "But we've got to be better than that. To score 30 points, you should be able to close out a game." Smith said individual rather than collective errors cost his team and has urged his players to improve their discipline. "The penalties came in twofold. Some were at the breakdown, others were in the setpiece. So there are two areas we need to sort out. Discipline is a big focus for us and we are getting on top of it and that is the price of winning. Smith, whose side next face Wasps, added: "We have to keep our belief, we did enough things to win that game and we need to remember that. "There are things we need to work on and improve but it is important we don't throw the baby out with the bath water."